At one point in Marc Turtletaub's intoxicating, quietly profound drama Puzzle, Irrfan Khan's puzzle champion calls Kelly Macdonald's sheltered housewife "a damn rebel". Is there such a thing as a rebellious jigsaw puzzle player? I don't know, but then Puzzle is a movie that makes putting the pieces together exhilerating and romantic, so anything is possible. Based on a 2010 Argentine film, Puzzle is a quiet wonder, one of those little films that comes out each year and leaves an indelible mark. Macdonald, long overdue for a film that is unquestionably hers, shines as Agnes, a Connecticut housewife who has been taken for granted too long by her old-fashioned husband Louie (David Denman), and her two lazy sons. The opening scene is brilliant, and tells us everything we need to know about her. A party is going on in her house, the place is full and Agnes is moving from room to room making sure everyone, including Gabe, are comfortable and taken care of. She's in her wheelhouse watching over others, picking up after them. And then she emerges out of the kitchen with a birthday cake...for herself. The party is for HER. That's just the kind of life Agnes has built for herself, one in which Louie works in his struggling auto repair shop while she goes to church and takes care of the house. When he comes home, he expects dinner on the table. It's not a bad life, but one where Agnes doesn't get to experience much of the world. She doesn't understand owning a smartphone, and when her son brings a worldly girlfriend over for dinner, confesses that she doesn't understand what being a Buddhist vegan really means. Jigsaw puzzles are such an obvious, on-the-nose metaphor that we don't see them used much in movies. Something is broken and needs to be put back together, piece by piece. But it works here, thanks to a thoughtful, moving script by Oren Moverman (The Messenger) and Polly Mann. Agnes' world, and that of her family, is forever changed when she is gifted a 1000-piece puzzle, which she zips together in record time. Something has been awoken within her. Setting off to New York to buy more puzzles and feed her need, Agnes answers a curious ad by a champion puzzler in need of a partner. Robert (the great Irrfan Khan) is her polar opposite. He isn't religious, he's quick-witted and deep-thinking, and strangely obsessed with natural disasters. He's also recovering from a recent divorce from the woman who had been his longtime puzzle partner. What could have been a corny story of romance and burgeoning independence is treated with subtlety and respect. Agnes discovers that she's a natural, and partnered up with Robert they are formidable team. But this isn't about their championship aspirations, thankfully. That would have been the least interesting route for this story to take. Instead it's about Agnes, and how finding something she's good at broadens her world and instills a newfound confidence. 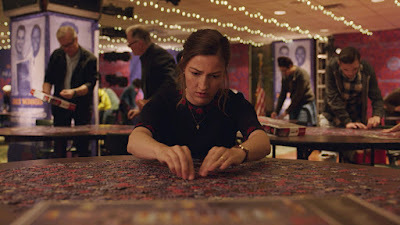 Seeing her, lip curled and eyes locked as she snaps the jigsaw pieces into place, we see a woman completely at ease with herself, a far cry from when the movie began. With a healthy dose of romantic tension between her and Robert, watching a puzzle put together has never been so engrossing. Macdonald, who broke out with her role in Trainspotting, has always excelled at playing quietly women content to stay in the background. 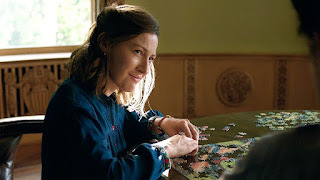 In the beginning it seems like Puzzle will be just another easy role for her, so it's fascinating to watch Macdonald's performance evolve as Agnes grows more forceful and confident. This is also a bit of a departure for Khan, who to me always strikes a fatherly impression. I don't get that from him this time; Robert is a little more eccentric than we usually see from the terrific Indian actor. Denman is also perfectly cast as Louie, who may be a sexist loaf but, like Agnes, he only knows what he knows. A lesser film would have painted him as a terrible, abusive husband we want to see Agnes get away from. The choices she ends up making in the end aren't about his problems, but about her needs as an individual. 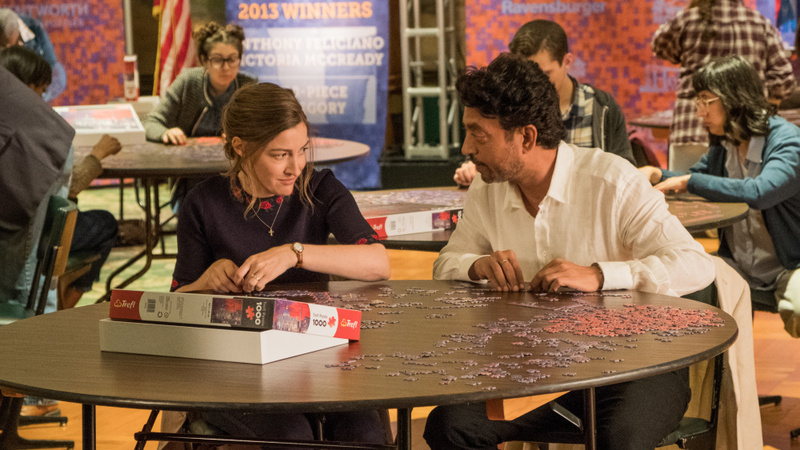 Does Puzzle completely sell the idea that a love of puzzles can change one's entire life? Well, that I'm not so sure, but Agnes' transformation is beautiful to watch unfold, and Macdonald's performance affirmation that she is, quietly, one of our great treasures.